The cathedral of St. Michael is a modest 1950s church in the centre of Japan’s famous port city. We were commissioned to build a new organ of 18 stops to replace the former electronic instrument. The key and pedal action is mechanical with electric drawstop action, and the case is made of European oak. It is of an asymmetrical design, which has become very popular with other organs we have built in Japan. The organ is primarily intended to accompany services and the cathedral’s amateur choir, although in the meantime has become valuable for teaching organ students and for occasional concerts and recitals. Kobe is in an active earthquake area, which means certain measures have to been taken to protect the instrument (and people standing near it) in the event of an earthquake. The instrument is anchored to the floor and walls, and pipes over 4ft in length (and all façade pipes) are tied to stays. 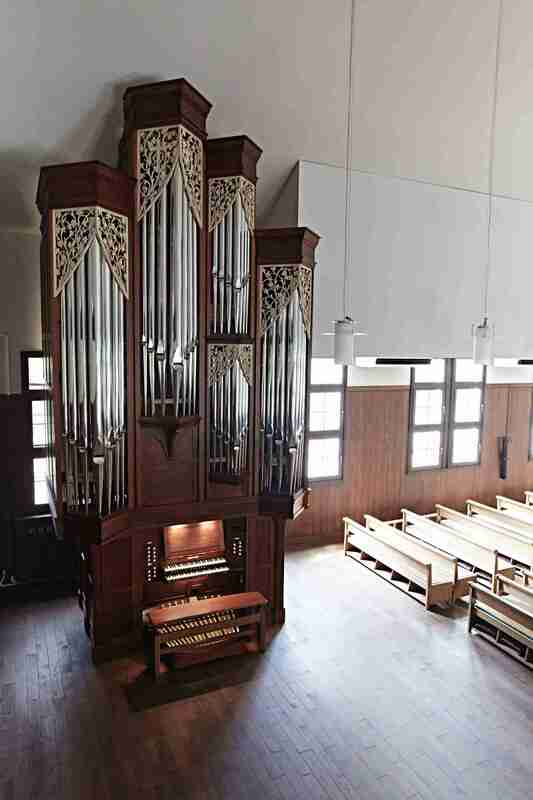 This is Mander Organs’ eighth instrument in Japan, and was completed in 2013. View the Specification of the St Michael’s Cathedral's organ and pipe scales.